Apple watchers can now see how truly huge the company's iPhone business has become, thanks to a new accounting method the company started using this past quarter. In less than three years, the iPhone has grown to become Apple's biggest business—up from zero. Specifically, during Apple's December quarter, the company reported $5.6 billion of iPhone-related revenue, up 90% year-over-year. That edged out the Mac business ($4.5 billion) and iPod business ($3.4 billion) for the second quarter in a row and the third time ever. 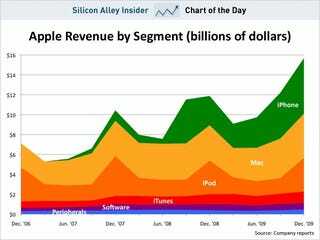 It was the first time the iPhone has beat the Mac and iPod businesses by more than $1 billion each. And this despite Apple missing Wall Street's expectations for iPhone sales, thanks to increased competition from Google Android and other smartphones. Why the new visibility? During the quarter, Apple started taking advantage of new accounting rules that lets it report the vast majority of revenue from iPhones and Apple TV devices immediately. Previously, it had to spread the revenue over 24 months to account for free software updates it would offer those customers.